I had met with Edgars to discuss the event and itinerary some weeks prior and was excited to see a programme containing such anthemic arrangements as Elvis Presley’s ‘American Trilogy’ and Bette Middler’s ‘The Rose’, alongside hit show tunes ‘Love Changes Everything’ (Phantom of The Opera) and ‘Bring Him Home’ (Les Miserables) and classic choral standards: When The Saints Go Marching In, Gwahoddiad, and Swing Low. We had a quick briefing session on each tune, as some of the arrangements had been developed from the conductor’s scores I was to work from. There were no drum charts at all, so I was completely free to compose and play around Edgar’s directions. What trust! Paper Management: If you have never seen a conductor’s score before, this is the chart which carries the entire notation for all instruments – and in this case, also voices – for the whole piece: as such, there could be anywhere between 2 and 4 (5, 6 or even more!) stanzas. This written part will give you a lot of helpful information with which to build effective percussion: composition, in terms of sections: i.e. intro/verse/chorus/solos; dynamics; marks of expression; unison figures (or hits/stabs) etc. It can also provide a direct template for you to write your own notes around: I found sketching-in kit ideas over the bass/left hand piano stanza worked particularly well for the pop tunes, as this would often reflect a bass guitar rhythm to lock the bass drum with. Be Resourceful: I decided to log onto YouTube and find recordings which related to the written arrangements I had to work from and in most cases this was very useful. The trick here is to first follow the chart with the recording and check it is the same basic arrangement: no bother if not, you can still use ideas from it, just don’t get too used to the audio as this could throw you later. I tend to treat each piece of music on its own merits in terms of organising how I will learn it and/or put a part together: I know the songs ‘When The Saints Go Marching In’ and ‘Swing Low’, but the arrangements for this performance could be quite specific, so the chart would help with that; the show tunes had highly comparable versions on YouTube, so I could base parts directly around what was being played on those. I find that flexibility is a good attribute to have in these minimal rehearsal situations and as I knew that there would be a run through in the afternoon prior to the performance, made sure that I had options prepared for any uncertain sections which could easily be changed ‘on-the-fly’. Know the Context: The ensemble might not be the same as on the charts or the recordings. Confirm the instrumentation you will be playing alongside and factor this in with your preparations. 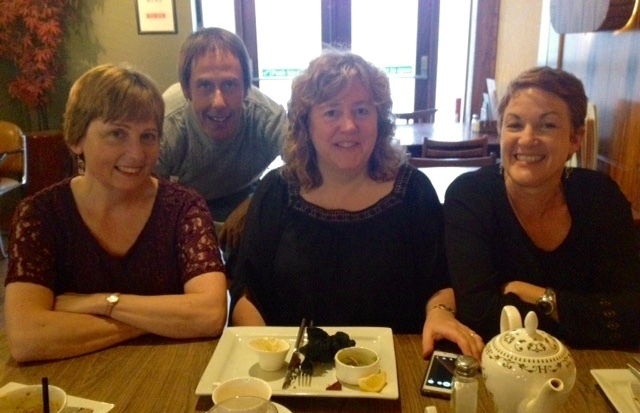 L to R: Jenny, Lee, Claire and Tori – One Voice For Care ensemble, taking a break. Your set up: Know beforehand how much, or how little space you will have to set up in and keep this in mind when considering your rig and putting parts together. On this logistical note, it is also worth checking how much time you will have to set up and pack down, as both of these factors could affect what kit you can or can’t use. At the One Voice show here, I was lucky enough to have over an hour’s clear access after the technical staff had finished – and also plenty of space – so I took this opportunity to load in early and tune the Gretsch which, ironically, took all of about 30 seconds: she sounded just great, straight out of the cases! It was nice to be able to play a little and get a feel for the sound inside the venue, and to check the feed options for my in-ear monitors with the crew. 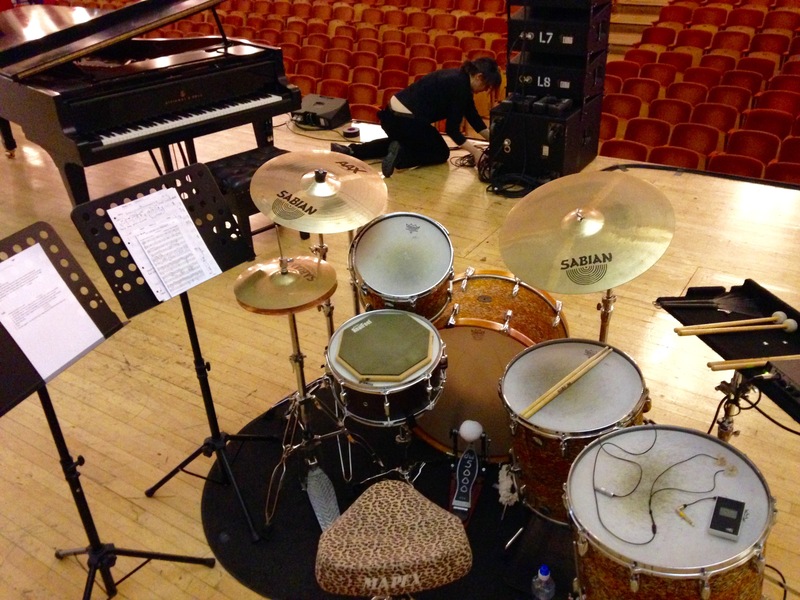 The obligatory ‘My office for the night’ set up picture…! Two music stands: remember all those stanzas I mentioned earlier? One of my charts was made up of twelve A4 sheets: make life easy for yourself and concertina multi page charts together so you can spread them out comfortably – without spilling them all over the stage! The two floor toms might look a little excessive, but the 16″ and 18″ made for convincing utility timpani and thunderous bottom end for big ballad fills; See the lambswool beater on the bass drum pedal? This is a 24″, undamped kick, which I use most often playing in free improvised music situations as you can affect the note lengths, but it works just great for orchestral effects, and once again, big, warm, open ballad feels. I also used a stick tray as there were a lot of quick beater changes and I don’t like using a stick bag on my floor tom: why? …because it really hampers the drum’s ability to resonate: try playing your floor tom with one attached and contrast with it off – see if you find the same result. I didn’t actually get too much time on the practice pad, but I like to take one to help keep my mind on the job and the hands ever ready! 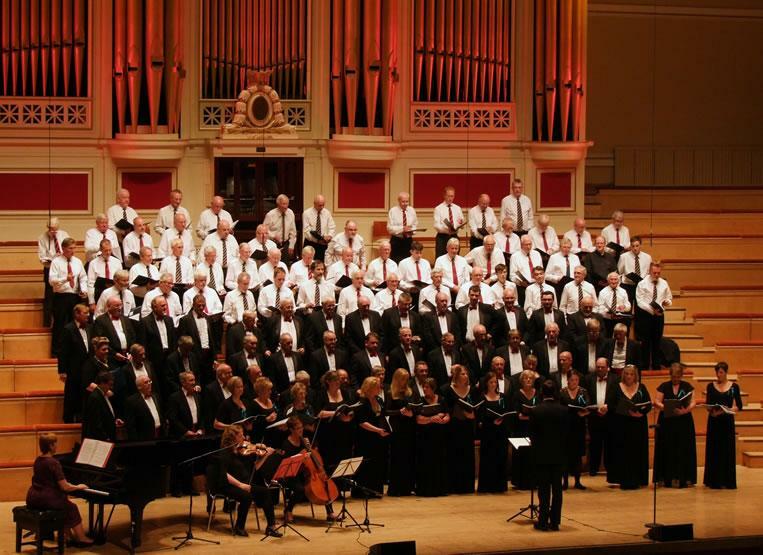 Choir and musicians at One Voice For Care 2015, De Montfort Hall, Leicester. Drums out of shot! The event was a great success – especially so as the choirs and musicians had only the two hour rehearsal together on the day. More importantly, the venue was just short of sold out on the night, so the charities will have benefitted greatly from our collective endeavours. The Fron fellas call this ‘The Afterglow’….. Learn music performance and reading skills – and a whole lot more at the Dye House Drum Works drum school, Leicester. 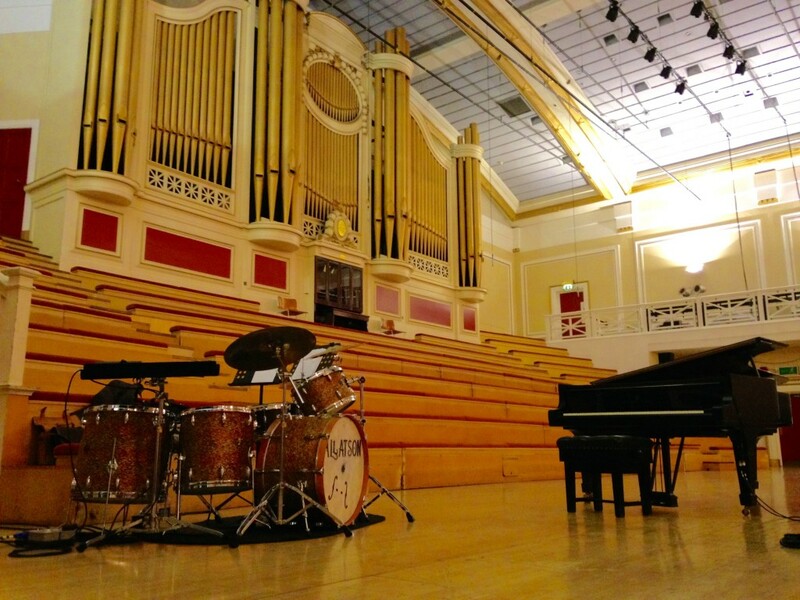 This entry was posted in Advice, In the community, News and tagged Drum lessons Leicester, Dye House Drum Works, Leicester Drum School, Live Session Drumming, Session Drummer Leicester, Using Drum Charts by Lee. Bookmark the permalink.